Only a few more days until the 4th of July! I love the 4th and I look forward to it every year. My family always has a BBQ and we make homemade vanilla ice cream topped with fresh raspberries and we light fireworks. Speaking of fireworks . . . they are going non-stop outside my house right now . . . boom boom pop pop . . . that is all I can hear. 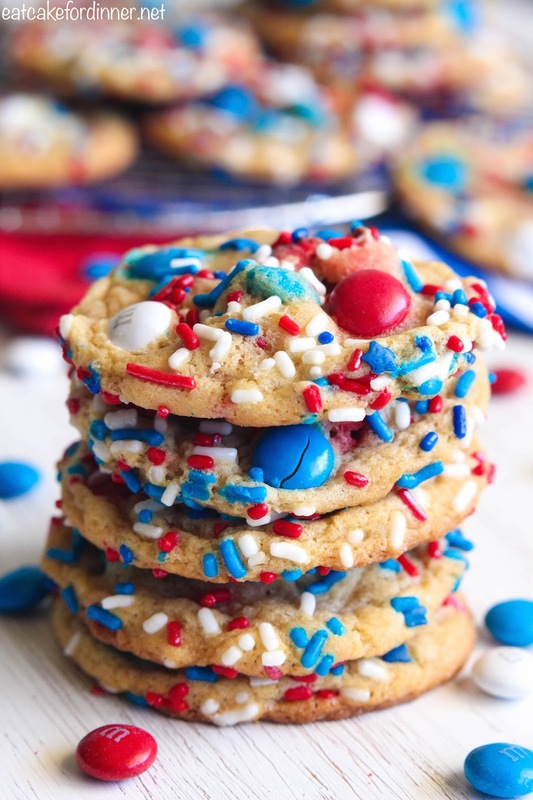 Do you have any fun traditions for the 4th? Do you prefer to light your own fireworks or go out to a firework show? Last Fall, I made these Candy Corn M&M Funfetti Cookies and I loved them. So, of course, I needed a fun 4th of July version. 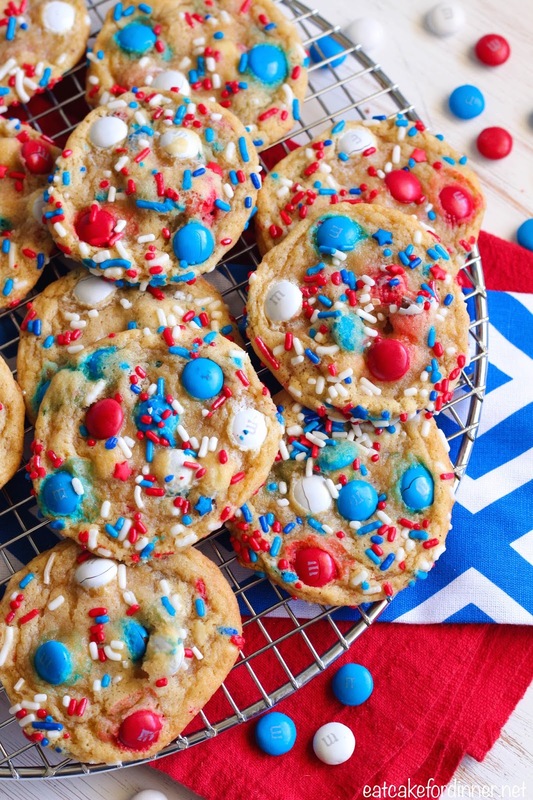 These rich and buttery cookies are soft and chewy and so dang good. I did leave the sprinkles off one of the batches for my hubby, but he actually ended up eating the ones with sprinkles and said, "These are really good cookies." I hope you all have a fun and safe holiday. Cream together the butter, sugar and brown sugar until light and fluffy. Add the eggs and the vanilla and mix until combined. Add the flour, baking soda, salt and cornstarch and mix until combined. Stir in 1/2 of the bag of M&M's. Cover bowl with plastic wrap and refrigerate for at least 20 minutes or overnight. After dough has chilled, preheat oven to 375 degrees. Scoop around 1 1/2 - 2 Tbl. 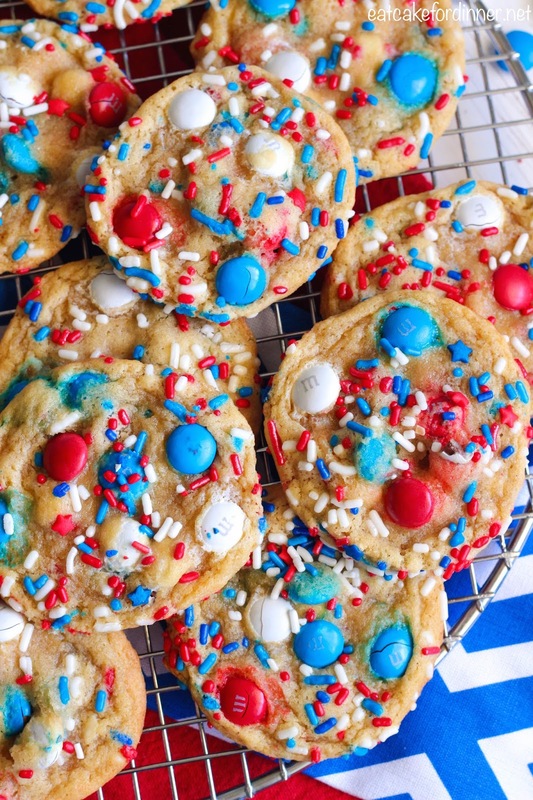 of cookie dough and roll into a ball, press a few more M&M's into the top of the dough ball and dip the top in sprinkles; place on a greased baking sheet. Repeat. Place 9 dough balls per cookie sheet. Bake for 8 minutes. Edges will be slightly browned. They will look under done, but end up just right once they cool. 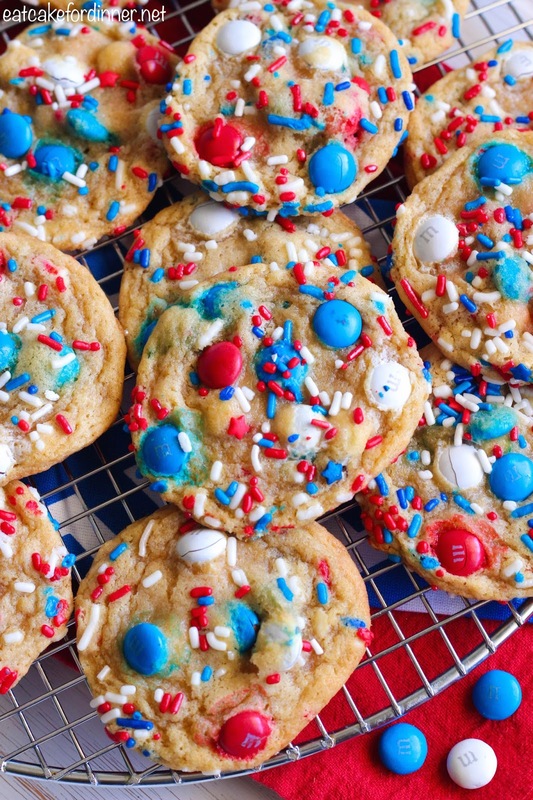 Remove from oven (if there are some empty spots, press a few more M&M's into the warm cookie). Leave on cookie sheet for a few minutes, then transfer to a wire rack to cool completely. Makes around 3 dozen cookies.